Learn how to speak the true language of websites at MDTV. 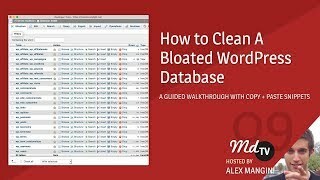 Learn how to safely clean up and organize your WordPress database tables from years of bloat. In this episode Alex shows you how to keep your child theme clean when adding code snippets. 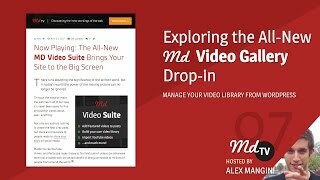 Alex gives you a tour of the new MD Video Suite that allows you to build and manage your own video gallery. By learning how the WordPress Loop works you will be able to pull many different kinds of dynamic content from around your site and embed them into your pages. In this episode, Alex walks you through 3 different ways you can use your browser’s inspector tools to interact with your website. A sneak peak of the upcoming MD Pro Share feature, a powerful way to add simple share icons around your MD powered site. Alex shows you the 2 best ways to add custom web fonts to your child theme, and talks how to best minimize their performance impact. The biggest reason websites load slow are due to heavy images. In this episode Alex shows you easy ways to make images weigh less and load faster. Alex shows you how to design custom Page Leads from the MDNET homepage + tips for working with page templates.